Rapid Drug Detox can help detox you from Methadone. Methadone was first introduced in the United States in 1947 by Eli Lilly and Company as a pain reliever. Since then, it is widely used in treating heroin addiction. Methadone is also used currently in managing chronic pain and is available in tablet form called Methadone and Methadose and liquid form (from clinics). Due to methadone’s totally synthetic structure (man-made chemical), its pharmacological effects are longer lasting than those of other opiate drugs allowing for once-daily administration in pain management and opiate treatment programs such as methadone clinics. However, the pain-relieving effects are shorter than the pharmacological half-life, so that dosing for pain control usually requires multiple doses per day. Depending on its form, Methadone can also be known as Dimepheptanol. As with heroin and all other opiates, methadone tolerance and methadone dependence usually develop with repeated doses. Tolerance to Methadone administered in a pain-control program usually occurs during the first few weeks of use; whereas respiratory depression, sedation, and nausea can be seen immediately. Despite its qualities as a pain reliever, methadone is one of the most difficult drugs from which to break clean and patients treated with methadone for pain frequently develop dependence that requires detoxification. As with heroin, methadone detox can be a painful process. Without the help of trained professionals, it can be riddled with withdrawal symptoms. Rapid Drug Detox can help free you from methadone addiction. Call Rapid Drug Detox at (888) 825-1020 to talk about our Methadone Detox program or contact us to learn more. On November 29, 2006, the U.S. Food and Drug Administration issued a Public Health Advisory about methadone entitled “Methadone Use for Pain Control May Result in Death and Life-Threatening Changes in Breathing and Heart Beat.” The advisory went on to say that “the FDA has received reports of death and life-threatening side effects in patients taking Methadone. These deaths and life-threatening side effects have occurred in patients newly starting Methadone for pain control and in patients who have switched to Methadone after being treated for pain with other strong narcotic pain relievers. Methadone can cause slow or shallow breathing and dangerous changes in heart beat that may not be felt by the patient.” The advisory urged that physicians use caution when prescribing Methadone. Methadone withdrawal symptoms are typically more severe than those of morphine or heroin at equivalent doses and are significantly more prolonged. Methadone withdrawal symptoms can last for several months or longer, so individuals maintained on methadone for long periods of time may in fact find it more difficult to break free of their dependence than someone in the same struggle with a heroin addiction. Most addicts find methadone withdrawal symptoms too severe to withstand without medical intervention. Withdrawal symptoms include: body aches and muscle cramping, back aches, leg kicking, irritability, anxiety, chills, shivering or trembling, abdominal cramping, weakness, increased blood pressure, convulsions, insomnia, diarrhea, running nose, watery eyes, sneezing, sweating, pale and clammy skin, nausea with or without vomiting, and thoughts of suicide. Methadone has traditionally been provided to the heroin-addict population through highly regulated methadone clinics. In the United States, clinics such as these stem from programs set up during the Nixon administration to combat heroin use, first in Washington, D.C., then nationwide. In addition to obtaining a daily methadone dose, some who treat in this type of clinic for addiction may receive psychological counseling for their addiction. Some are required to attend such programs but many are not. In recent years, methadone has gained popularity among physicians for the treatment of chronic pain. The increased usage has come as doctors’ search for an opioid drug that can be dosed less frequently than short-acting drugs like morphine or hydrocodone. Some physicians also choose methadone for treating chronic pain in patients who are thought to have a propensity for addiction. Most physicians do not realize that methadone is more highly addictive than traditional opiates and that ending methadone treatment is more difficult due to more severe withdrawal symptoms. 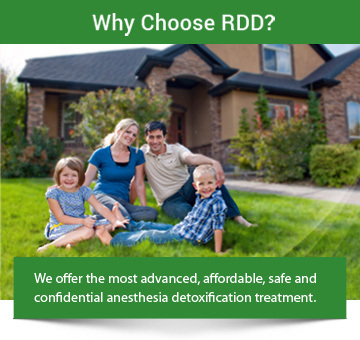 Rapid Drug Detox offers an affordable methadone detox program. Call Rapid Drug Detox at (888) 825-1020 or contact us to learn more. Many Methadone clinics are making available the Suboxone® treatment as a way of keeping their patients. We never use other replacement addicting opiates, often prescribed by physicians and detox centers, such as Suboxone®/Subutex (Buprenorphine) or injectable Buprenorphine. These schedule III controlled opiate drugs under The Federal Controlled Substance Act are routinely and widely used and approved by the FDA for opiate addiction maintenance, like Methadone. Many patients find themselves in the same situation as they were after switching to a Suboxone®/Subutex drug treatment from their methadone clinic, a private doctor or a drug rehabilitation center. We have heard of some in-patient rehab centers also using schedule II controlled liquid Hydrocodone and Dilaudid “cocktails”. Patients soon realize these replacement drugs cause severe withdrawal once they are discharged from these programs. This causes the patient to seek opiates for relief from the severe discomfort of a Buprenorphine or a replacement opiate withdrawal. The use of these drugs for treatment of opiate addiction is merely switching one opiate drug for another setting the patient up for failure. This does not solve the patient’s drug addiction problem. Stopping these replacement drugs sets the patient up for failure causing them to immediately seek drugs to relieve their withdrawal symptoms perpetuating their addiction and leaving them feeling like a failure and hopeless that there is a solution. It is important to question treatment centers and learn the truth about their programs. Trading one opiate drug for another is not an acceptable treatment and the promises of weaning off of these drugs are nearly impossible, rarely done with any success, and very misleading. As use of these drugs become more common, we are seeing a steady increase of requests for an anesthesia detox from patients addicted to Suboxone®/Subutex (Buprenorphine). Currently, approximately 15% of our patients are Suboxone addicted. With RDD’s Naltrexone Therapy used as a pellet/implant, injectable “IM” shot or the oral pill form, the patient stays clean and cravings are eliminated.